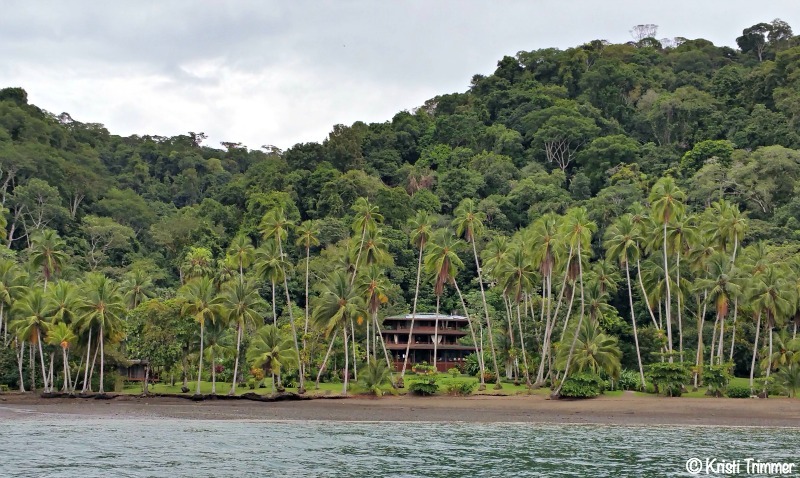 Read the first post about traveling to Iguana lodge on the Osa Peninsula in Costa Rica. 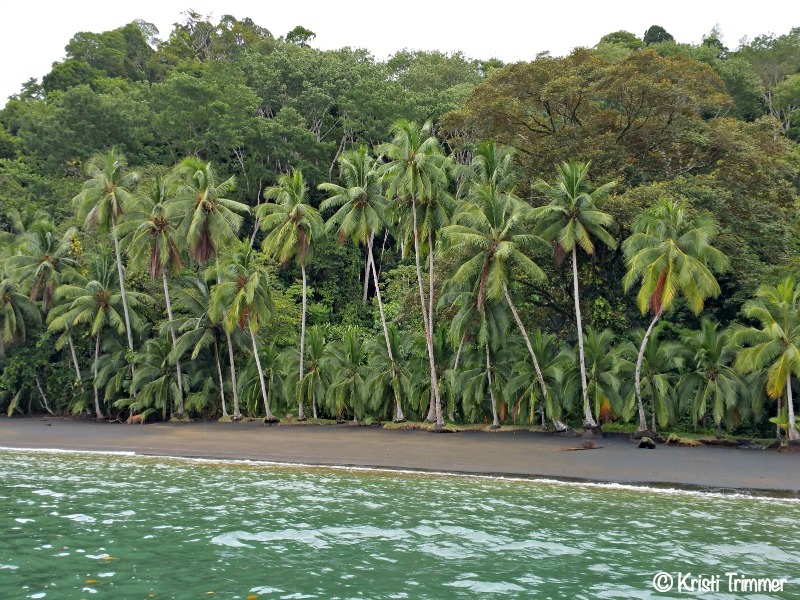 The Osa Peninsula is on the Pacific Ocean side down near Panama… a little slice of Paradise, in my opinion. Jana and I woke up to the Scarlet Macaws saying good morning bright and early at 5:15am. I thought roosters were loud, they have nothing on Macaws! Jana grabbed her camera and went out and caught the pink and orange sunrise. I stayed in bed and watched the sun rise through the thick forest trees. I closed my eyes, so grateful that I was in this magical place, that I was in Costa Rica! Scarlet Macaws mate for life. They are never without their mate, even 200 feet high in a tree! 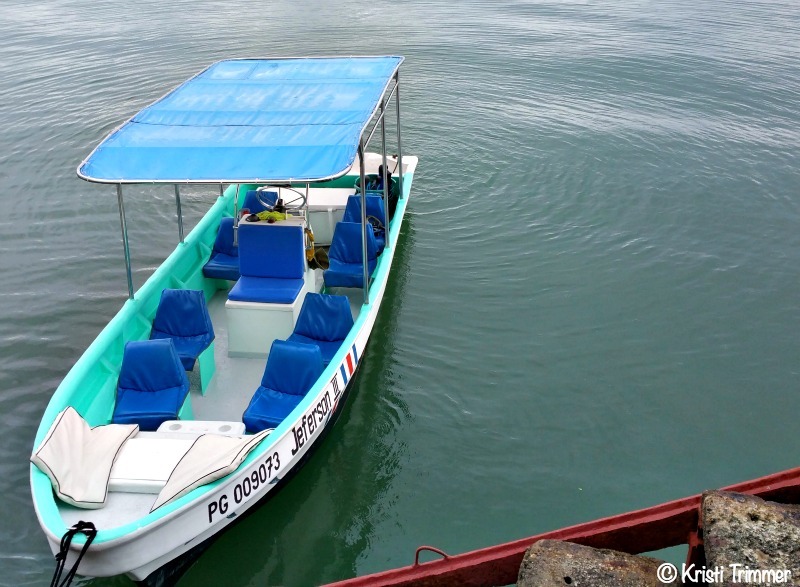 After a lovely breakfast of banana crepes, fresh mangos and pineapple, and papaya juice, we headed out on our first excursion. Iguana Lodge had us setup on a dolphin and snorkeling excursion that morning that would last about four hours. I couldn’t believe we had the boat to ourselves that morning! That is one of the benefits of traveling during the rainy season, or their off season. Very few tourists and we had the entire Osa Peninsula to ourselves! Love it! Jana and I headed out on the boat to see dolphins and do a little snorkeling. We have a good time hanging out wherever we are in the world. 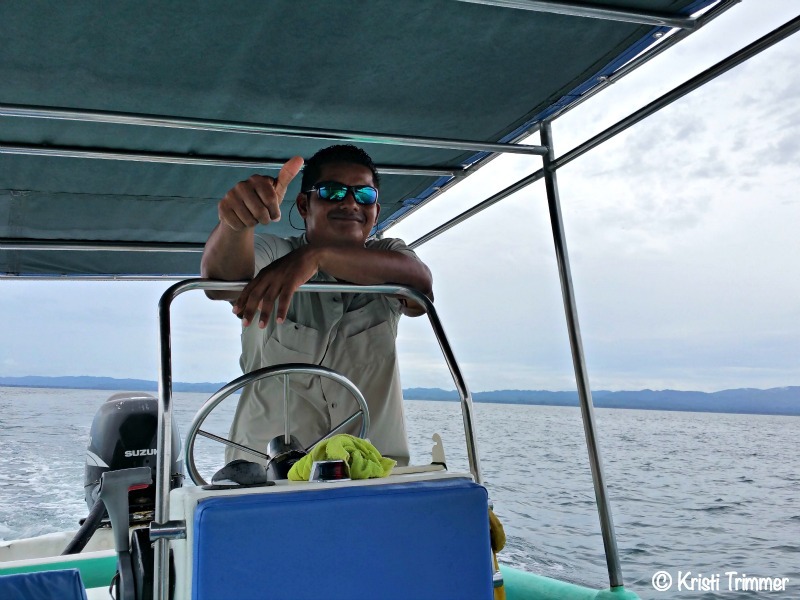 We saw SO many dolphins – males with females, females with babies, and a few loners feeding off the shores of the Osa Peninsula. We could have jumped in and swam with the dolphins, which I’ve done in Hawaii. 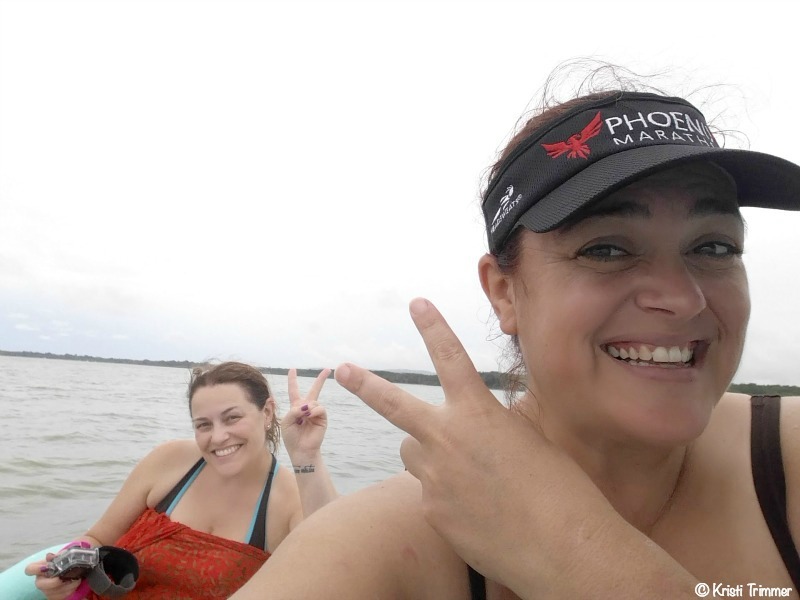 Jana and I chose not to though as the water was pretty murky and bull sharks were also heard to be feeding in the waters lately. Neither one of us were inclined to be bull shark food that day. Our Boat Captain’s name was Gordo and he was awesome. 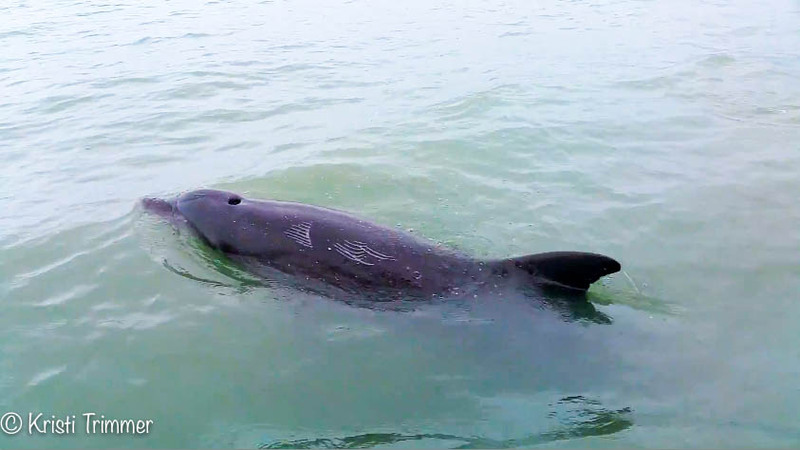 He knew just where the dolphins were and took us on a cruise around the bay. We saw Tucans and Kingfishers in the trees on the shore. Houses that seemed liked they stepped out of a paradise magazine. Those hours on the water were so serene and peaceful that I could have cruised those waters all day. Just one of the many casitas dotting the shoreline around the bay. Could you imagine living in this tropical oasis. Heaven, really! I’m fascinated with how the beaches with the jungle just feet away looks like something out of the Jungle Book, not real life. All of those palm trees were filled with coconuts too. My eyes couldn’t take in the beauty fast enough. It was the kind of scenery that reminds you that you are a small part of this very large world. Don’t worry, I will have a post on all the drinks that we had at Iguana Lodge! Their bartenders are true mixologists and make the perfect drink for each part of the day. This was hands down the best red sangria I have ever had. It was perfect after a day spent out on the water. When we first arrived at Iguana Lodge we noticed these ants carrying leaves through the forest. They started at dawn and trekked up this tall tree, at least 10 ants thick. They would cut out the leaves and crawl back down the tree and march 100 feet the other direction up another tree. I was fascinated with these little guys! Once the sun went down they were done for the day and went home to put their tired feet up, I imagine. Jana and I went to bed that night talking about all that we had seen during the day. We were like two little kids at Disneyland… playing with the dolphins and being in this paradise made us two happy girls. We were ziplining the next day and couldn’t wait as that was the #1 thing we both wanted to do in Costa Rica! 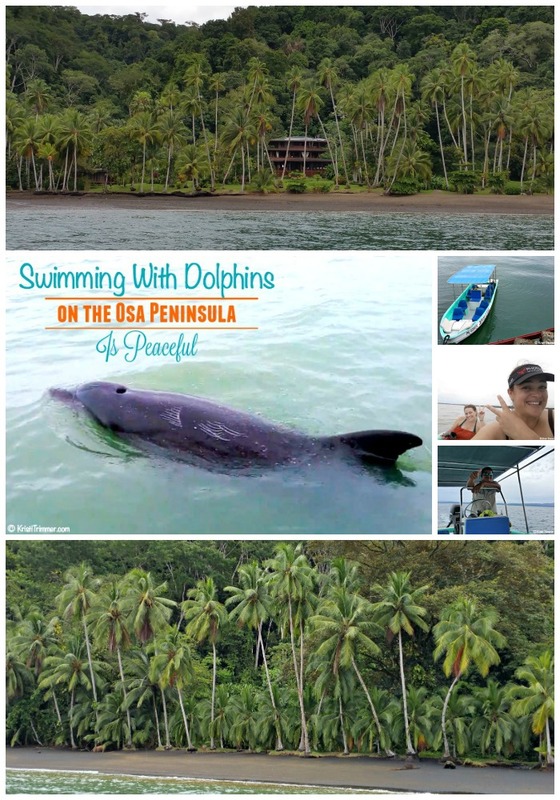 Have you ever swam with dolphins or want to go to Costa Rica? Tell me about it in the comments. I’ll have to get back! wow! this looks so fun! i swam with dolphins once and it was so cool! Wow, swimming with dolphins looks amazing! I would love to do it one day! This would be so awesome! I hope to travel once the kids are older and hopefully I’ll be able to swim with all of the beautiful creatures! Sign me up for the next trip!!! dolphin! how cool is that! This would be so awesome. It is something I would like for my son who is autistic and has tourettes to do. I hear it is quite healing. Wow what an amazing experience! I am sure you had a blast and the photos show just that. Great and beautiful photos by the way and I would love to swim with the dolphins!